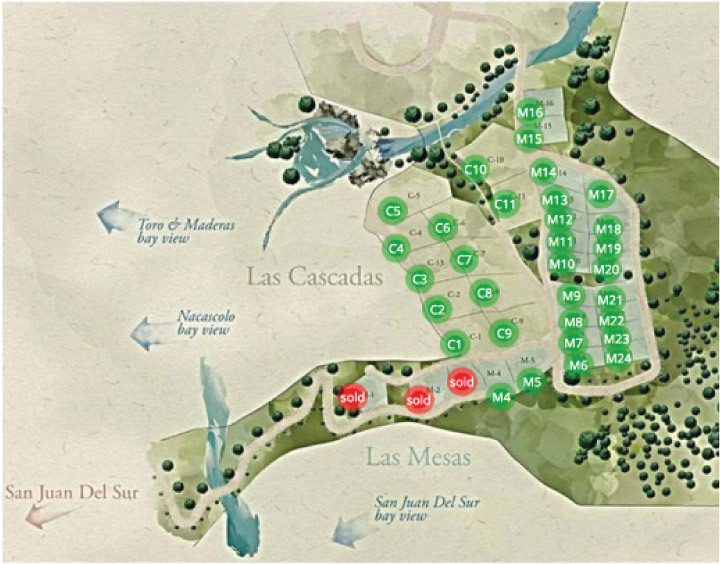 Across from Las Mesas, Las Cascadas feature large, open lots that look out over the Nacascolo, Toro and Maderas Bays to the west, and the continental divide to the north. Las Cascadas sit on the gently sloping hills at the center of El Encanto and offer the feeling of seclusion, even though they’re only a ten minute drive from town. Beautiful hardwood trees are scattered over the landscape, offering shade and bird watching opportunities. Just a short walk from the lots you can find the 40 foot waterfall after which the phase is named, as well as a number of hikes through Valle Encanto. Every Las Cascadas lot includes water service fed by El Encanto’s high-capacity wells, which are backed up by the city of San Juan. Each home can also be connected to our new and highly available Hybrid Solar MicroGrid, should you want all the benefits of green power without the hassle. And, if you’d like horses, we have a corral nearby where they can be looked after.